Did Evelyn Farkas Just Leak Information Confirming President Obama Spied on President Trump? Evelyn Farkas' 2 March 2017 MSNBC interview was decoupled from its context involving a 1 March 2017 article about efforts to preserve Obama-era intelligence. On 28 March 2017, an interview between Evelyn Farkas (former Obama administration Deputy Assistant Secretary of Defense for Russia and Ukraine) and MSNBC’s Mika Brzezinski began circulating alongside rumors Farkas “leaked” confirmation that the former President “spied” on then-candidate Donald Trump. In an appearance on MSNBC earlier this month, Farkas told Mika Brezinski about her role in the efforts to collect intelligence on Trump’s team, and their alleged ties with Russia, in the Obama adminstration’s final days. I was urging my former colleagues, and, and frankly speaking the people on the Hill … it was more actually aimed at telling the Hill people, get as much information as you can, get as much intelligence as you can before President Obama leaves the administration. Farkas’ remarks were apparently decoupled from the weeks-old Times item deliberately, creating the appearance she had made a novel admission in late March 2017. 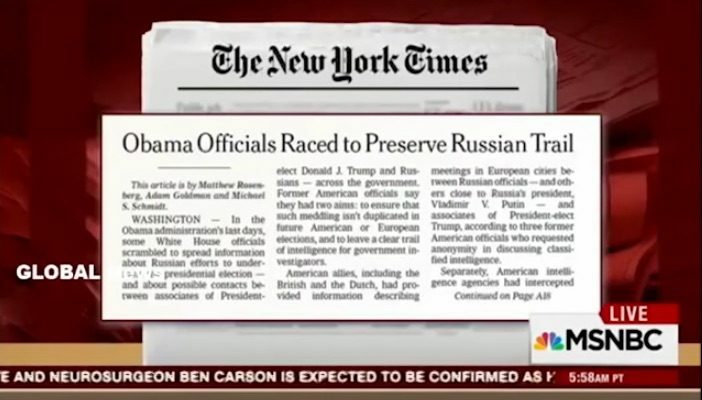 But the New York Times published a then-popular article titled “Obama Administration Rushed to Preserve Intelligence of Russian Election Hacking” on 1 March 2017, and Farkas’ since-viral MSNBC appearance took place the following day, on 2 March 2017. Noting that “[m]ore than a half-dozen current and former officials described various aspects of the effort to preserve and distribute the intelligence” to the newspaper during its investigation, the Times reported that some of the sources “said they were speaking to draw attention to the material and ensure proper investigation by Congress … [a]ll spoke on the condition of anonymity because they were discussing classified information.” The nature of the information made “public assessment of the competing Obama and Trump administration claims impossible,” the paper added. Separately, American intelligence agencies had intercepted communications of Russian officials, some of them within the Kremlin, discussing contacts with Trump associates … At the Obama White House, Mr. Trump’s [denials of contact with Russians] stoked fears among some that intelligence could be covered up or destroyed — or its sources exposed — once power changed hands. What followed was a push to preserve the intelligence that underscored the deep anxiety with which the White House and American intelligence agencies had come to view the threat from Moscow. It also reflected the suspicion among many in the Obama White House that the Trump campaign might have colluded with Russia on election email hacks — a suspicion that American officials say has not been confirmed. Former senior Obama administration officials said that none of the efforts were directed by Mr. Obama … As Inauguration Day approached, Obama White House officials grew convinced that the intelligence was damning and that they needed to ensure that as many people as possible inside government could see it, even if people without security clearances could not. Some officials began asking specific questions at intelligence briefings, knowing the answers would be archived and could be easily unearthed by investigators — including the Senate Intelligence Committee, which in early January announced an inquiry into Russian efforts to influence the election. There was also an effort to pass reports and other sensitive materials to Congress. In one instance, the State Department sent a cache of documents marked “secret” to Senator Benjamin Cardin of Maryland days before the Jan. 20 inauguration. The documents, detailing Russian efforts to intervene in elections worldwide, were sent in response to a request from Mr. Cardin, the top Democrat on the Foreign Relations Committee, and were shared with Republicans on the panel … Officials tightened the already small number of people who could access that information. They knew the information could not be kept from the new president or his top advisers, but wanted to narrow the number of people who might see the information, officials said. More than a half-dozen current and former officials described various aspects of the effort to preserve and distribute the intelligence, and some said they were speaking to draw attention to the material and ensure proper investigation by Congress. All spoke on the condition of anonymity because they were discussing classified information, nearly all of which remains secret, making an independent public assessment of the competing Obama and Trump administration claims impossible.Some Obama White House officials had little faith that a Trump administration would make good on such pledges, and the efforts to preserve the intelligence continued until the administration’s final hours. This was partly because intelligence was still being collected and analyzed, but it also reflected the sentiment among many administration officials that they had not recognized the scale of the Russian campaign until it was too late. What intensified the alarm at the Obama White House was a campaign of cyberattacks on state electoral systems in September, which led the administration to deliver a public accusation against the Russians in October. Nothing said or repeated by Evelyn Farkas on 2 March 2017 was novel or ostensibly more revealing than the New York Times article published just before her interview, and Farkas described the actions of Washington operatives (not President Obama) to preserve extant intelligence about Russian efforts to undermine the presidential election (not to spy on Donald Trump). We have attempted to contact Evelyn Farkas but have not yet received a response. Fox News. 29 March 2017. RealClear Politics. 30 March 2017. The New York Times. 1 March 2017.